The British pound was supported by the Brexit negotiations but then Bank of England decision regarding the interest rates weighed on GBP. 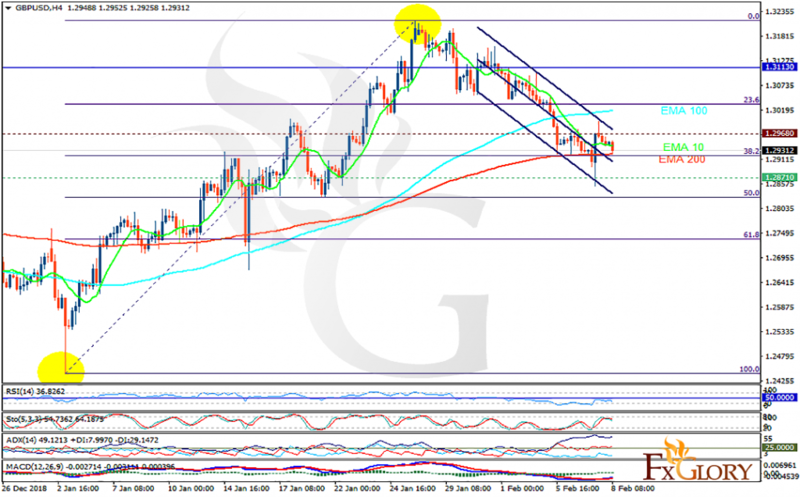 The support rests at 1.28710 with resistance at 1.29680 which both lines are below the weekly pivot point at 1.31130. The EMA of 10 is moving with bearish bias in the descendant channel and it is above the EMA 200 and below the EMA of 100. The RSI is moving in oversold area and the Stochastic is moving in high ranges. The MACD line is above the signal line in the positive territory. The ADX is showing sell signals. The indicators are showing mixed signals. The support level breakthrough may push the price down towards 61.8 level of Fibonacci at 1.275, otherwise, the pair may grow towards 1.300.